Patients throughout the world rely on prescriptions to help them combat and ease symptoms for a multitude of illnesses and injuries. We place a great deal of faith in the medical practitioners that assess our health and administer subsequent prescriptions to us. If an error is made in the treatment that we are given, illnesses and injuries can be made worse and can even result in death. It is therefore important that anyone who has been a victim of a prescription error knows how to make a claim for the compensation that they rightfully deserve. Am I eligible to make a prescription error claim for compensation? Patients have the responsibility to ensure that they are taking the medication that they were prescribed in the right dosage amount advised. However, if it can be proved that a pharmacist has dispensed incorrect medication or medicines at the wrong amount, and this has resulted in illness or injury to the patient, it is likely that a successful claim for compensation can be made. The wrong prescription given – a mistake made by the doctor or the pharmacist could mean that the wrong medication is given to the patient. This type of error can have disastrous consequences for the patient, especially if the error goes unnoticed for a long period of time. Medication prescribed for too long – injuries or illnesses can be caused to patients if a medication has been prescribed for too long a duration. All medicines have side effects and taking them over an extended period of time has obvious risks of injuries and harm. Such errors mostly take place when patients are allowed to order repeated prescriptions without visiting their doctors. Prescribing an incorrect dosage – even if it is the same medication, it can be available in different doses. Mistakes can take place when a doctor prescribes the incorrect dose. Prescription errors can also happen if the pharmacist supplies the incorrect dose after misreading the prescription. Prescribing medication to which the patient is allergic – a patient may be allergic to certain drugs, and if this is noted in their medical report, it is important that doctors are careful when prescribing medication. Serious side effects can occur if a patient has been prescribed medication that he or she is allergic to. 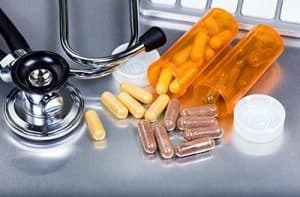 Prescriptions for medications which should not be taken together – there are times when a patient may be prescribed with two or more medications, whether for the same condition or to treat multiple illnesses or injuries. Certain medications should not be taken together, as they can cause serious reactions, or negate the intended benefits of the treatment. This type of prescription error can happen when a doctor has prescribed a new medication without checking or overlooking what other medications the patient is already taking. Medical practitioners and pharmacists have a legal duty of care to ensure that they prescribe the best treatments and medicines to their patients as they believe to be correct. It is imperative that a full analysis of the patient and their medical history is undertaken prior to any medicines being prescribed. Patients may find themselves suffering from a host of symptoms having been prescribed incorrect medication or medicines at an incorrect dosage. Did you know? Data from the Health & Social Care Information Centre shows that in 2012 there were approximately 2.7 million items prescribed in England each day, which equates to a massive 1,900 items prescribed every minute. The severity and impact of the symptoms will be significant in determining the amount of compensation that you may be entitled to claim. Symptoms of prescription errors may include worsening of previous illnesses and injuries, unexpected and significant side effects, the ineffectiveness of other medications and new and more serious conditions being developed. Any patient who has suffered as a result of a breach of the doctor or pharmacist’s duty of care is likely to be eligible to make a claim for compensation. Our solicitors will be pleased to review your individual case and offer bespoke advice with regards to your eligibility and the likely outcome and award of your claim. If you believe that you have been the victim of a prescription error and have suffered further illness, injury or loss as a result, contact us to discuss initiating a claim for compensation. Your solicitor will be responsible for demonstrating that another party is liable for the losses or illness that you are suffering from and the severity of your symptoms. To do this, the solicitor will work alongside you to gather appropriate evidence and documentation to support your claim. This is likely to include medical records, proof of impact on your daily life and any evidence that proves the medical or pharmaceutical error. Once your solicitor has gathered sufficient information, they will build a case to present to the defendant and will negotiate your compensation. At all times, your solicitor will keep you updated and will strive to achieve the highest settlement award possible on your behalf. One of the most common questions that we are asked at the beginning of any claim is ‘how much compensation will I receive?’. The answer is that the amount that you are awarded will depend upon your personal circumstances and the severity of your illness or injury. Your solicitor will aim to achieve the highest possible settlement figure by proving the detrimental effect that your condition has had on your life. General damages – this amount compensates you for the pain, suffering and loss of amenity caused by your injury or illness. Special damages – this amount compensates you for any financial losses sustained, such as loss of earnings and medication costs. The length of time that it takes to process your case will depend upon the circumstances of your case. Times can vary depending upon the complexity of individual details and whether liability for your injury or illness is accepted by the party responsible. If liability is not accepted, the time taken to conclude your claim can be anything from a couple of months to more than a year. Your solicitor will seek to complete the case as soon as is possible without compromising on the amount that you are awarded. If you would like to find out if you have a valid claim, or would simply like to talk to somebody about your case, we would love to hear from you. We provide a completely free consultation service, where we can assess your potential claim and answer any questions you may have. If you are eligible for compensation, our solicitors will be able to help you on a no win no fee basis.